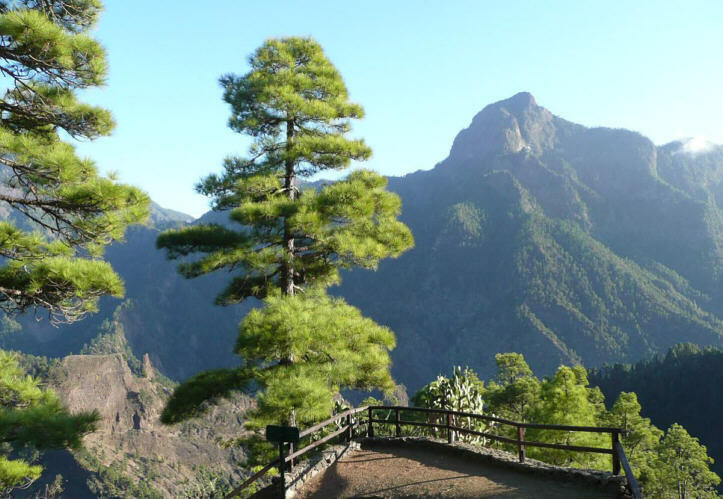 About two million years ago, a great volcanic erruption formed the island of La Palma and its Caldera de Taburiente, one of the greatest in the world. Walking through the caldera is considered to be one of the best possible walks on our beautiful island! 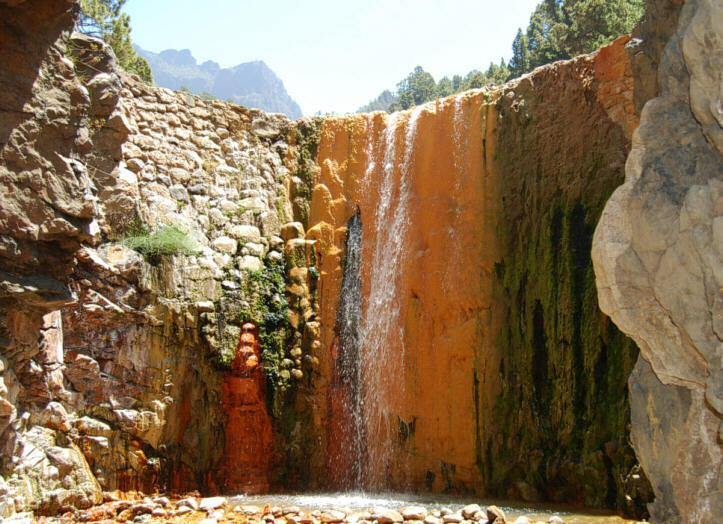 The main entrance to visit the caldera is accessible via LP-3 road (Santa Cruz - El Paso). 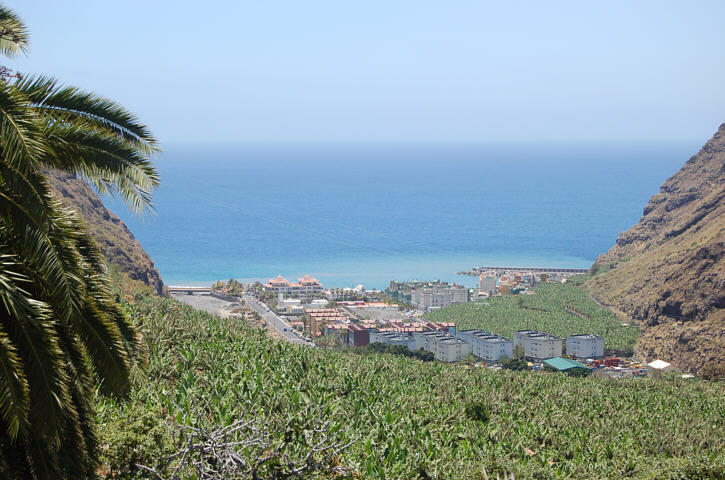 At the Visiting Centre (Centro de Visitantes) one could study the geology, flora and fauna of the caldera. There is a small autoguided museum and a short movie could be seen for free upon request at the entrance. A detailed free map with the caldera and information about the routes could be also provided by the friendly staff there. The access by car or bus to "La Cumbrecita" must be reserved from time by your guide. Heavy or persistent rainfall, possible to occur only during storms and mostly in the winter, can loosen the rocks and endanger the visitors, but the weather and paths are carefully monitored by the park authorities. It's recommended having some knowledge of the park or employing a professional walking guide if you are visiting and also check that the park is open before setting off. Part of your Caldera de Taburiente visit, following the Bitter Almond ravine, the road diverts to the cascade of colors (Cascada de los Colores). It is located in the same ravine Rivanceras with the "tourist" waterfall, but about a mile above this. There are several ways to get there: from Cumbrecita, from Bejenao skirts, and others. Cascada de los Colores is a marvel. It is called the "authentic" because does not include any artificial structure, has more colors and it is higher in a narrowing of the walls that barely allows the sun's rays reach. By the cascade, there is a six meter high rock grabbing usually wet and slippery, be aware and better wearing adequate shoes. The waters are clear and good taste safe to drink, so you could jump and take a short bath there! A natural semicircular wall protects the ravine where the cascade takes vivid green, red, yellow and ocher colors! 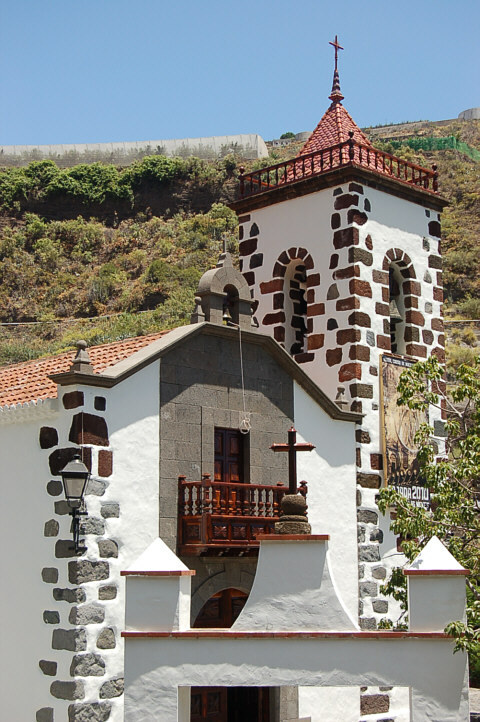 The Sanctuary of the Virgin of Sorrows (Nuestra Señora de las Angustias) is a small pitoresque church accessible via the LP-120 road close to the town of Tazacorte. The bed of the Barranco of Sorrows marks the boundary with the Tijarafe by the North and its slopes are situated between the sanctuary of Sorrows. Its ajar doors give way to the building of a single nave and chancel to render devotion to Our Lady of Sorrows. Built in the sixteenth century, the Virgin of Sorrows comes from Antwerp, whose writings on its first inventory date from 1522. Winding up on the main road LP-1 to the end of the greatest ravine "Barranco de Las Angustias", one could reach the astronomical viewpoint (mirador) and the restaurant La Muralla (The Wall). Each astronomical viewpoint has enough parking space, level ground suitable for using tripods, a sign pointing to the North Star, and a nice information panel. This viewing point high on a cliff top has splendid panoramas of the plains town of Los Llanos de Aridane and the 300 meters below Atlantic ocean. 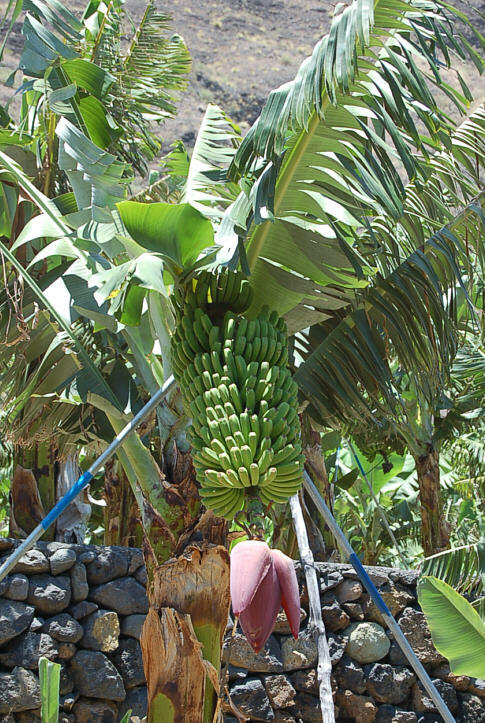 Located in the West of La Palma, Tazacorte is the smallest municipal district on the island, having the biggest banana production of the Canaries. 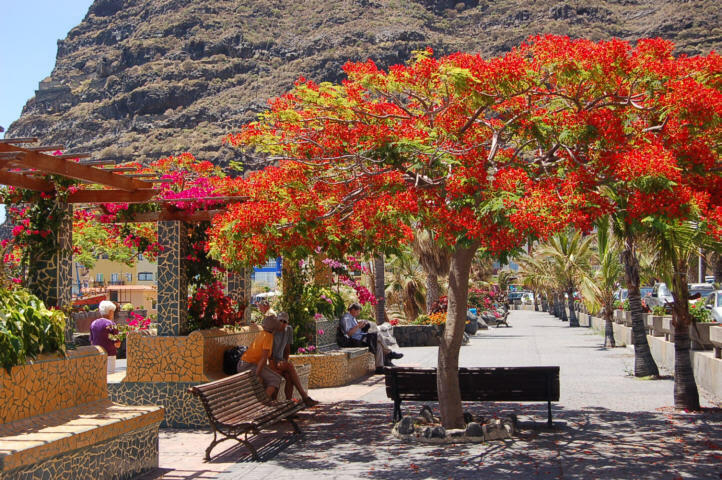 Embedded in typical Canarian architecture, the charming small town of Tazacorte welcomes the visitors with a colourful town hall, the church Saint San Miguel and few picturesque plazas. 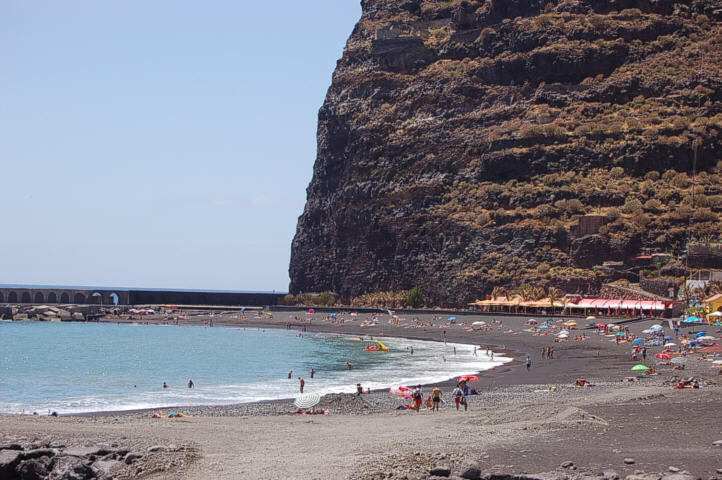 Down the sea, the popular beach of Tazacorte is sunny most of the time of the year! Here, tourists love to stay near the small Plaza Castilla, walk on the beach promenade or take lunch or dinner in small restaurants, typical bars, surrounded by the marvellous views of sunset over the Atlantic. 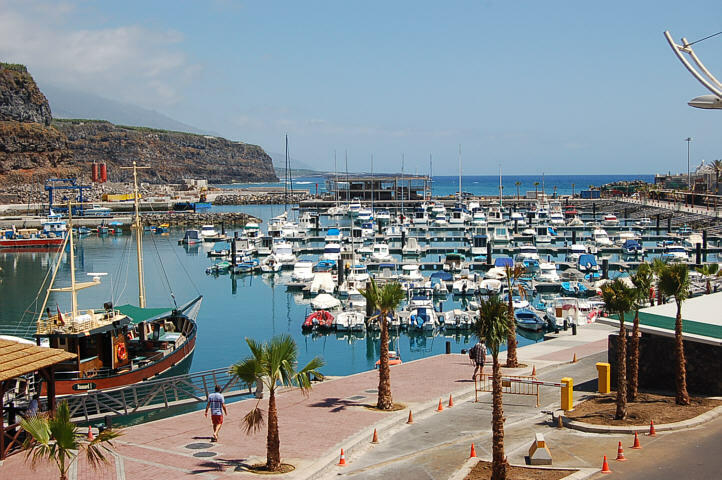 A little bit further South, the visitors encouter the small Puerto de Tazacorte, with a beautiful, long sandy beach and yacht and fishing harbour. Few hour sail could be embarked in few small boats to give you unforgettable marine life experience which include dolphins!